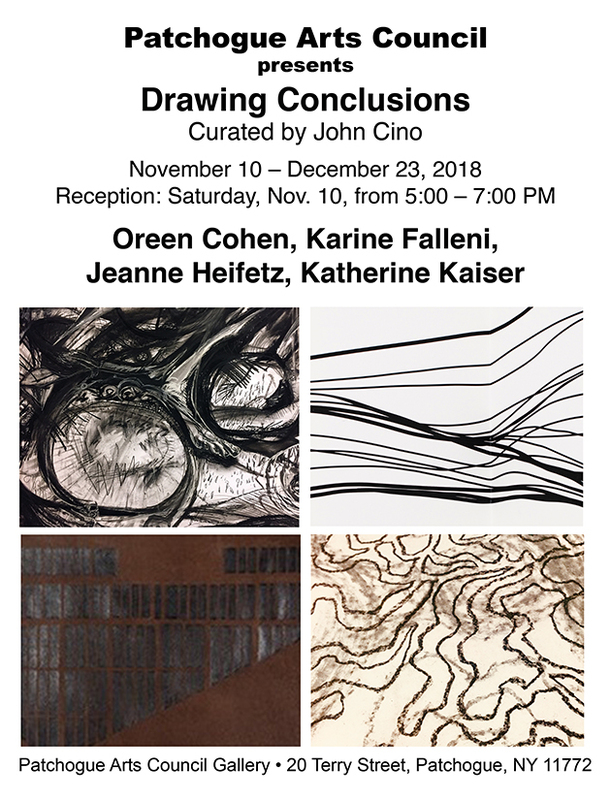 Exhibit: "Drawing Conclusions" @ the PAC Gallery | Patchogue Arts Council, Inc.
Patchogue Art Gallery’s 2018 calendar draws to a conclusion with Drawing Conclusions opening on November 10. The exhibition will remain on view through December 23. There will be an artist’s reception on November 10 between 5 and 7 pm. All are welcome to this free event. Oreen Cohen references New York School painting as she creates monumental gestural drawings with the strength and power of abstract expressionist painting. Looking to a more recent genre Karine Falleni turns the walls of the gallery into her drawing surface. Falleni’s works straddle the space between performance and installation. Katherine Kaiser’s large format drawings are both intimate and monumental. Making use of a tightly rendered line quality often associated with a smaller scale Kaiser pulls you into a detailed world of obsessive abstraction often associated with Post Minimalism. Jennifer Heifetz nods to the Minimalists and Conceptual artists with an installation of grid within grid. In her Pre-Occupied series Heifetz creates rich surfaces of powdered pigment and graphite through rubbing and burnishing imparting a leather like surface to the paper. Heifetz truly draws conclusions as her images reveal site plans for cemetery plots. While each artist finds references in past traditions of modernism, they all carve out for themselves a unique place where drawing becomes something more.